Kitchen! Kitchen! 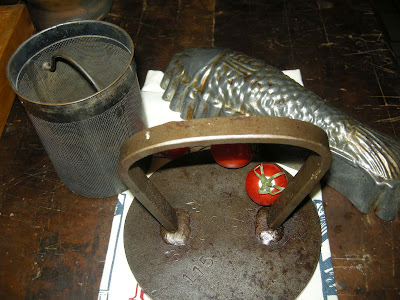 : a nasty, nasty habit of collecting old kitchen implements....at kitchen! kitchen! a nasty, nasty habit of collecting old kitchen implements....at kitchen! kitchen! ﻿﻿ I have this nasty habit of collecting old and antique kitchen implements. Must be some sort of a "collecting disease" that I can't seem to get rid of. I scour flea markets and antique stores and my eyes zeros in on anything and everything for the kitchen. The more strange looking they are the more fascinated I am. I love to guess and wonder what these tools were used for. These implements must have helped the previous owner create one of the most wonderful dishes. Take the fish mold for example, this must have been used to make a delicious fish aspic; as for the heavy disc with a handle, I really can't figure out what it was used for. But, I find it very useful for holding down panini sandwiches. And the flour strainer, I use it to hold small wooden spoons that I collect (what else)! So if the bug of collecting old kitchen tools hits you, don't resist, go for it.